Mould growth in the attic is extremely common, in fact I would rate it second next to the basement area in my experience. Most homeowners however do not spend much, if any time in their attic and therefore the issue of mold in the attic only becomes an issue when a home inspector discovers it at the most inopportune time, when they are trying to sell their home. When they upgrade their insulation they are informed by the insulation installer or the home inspector that they have a problem and can’t sell the property until the situation is rectified. Ottawa Mold Removal will removing the mould in your attic and correct the source of the issue permanently. Our guarantee will ensure peace of mind both for the buyer and for the home owner. Just to make ensure we are on the same page, if your attic resembles the following, then you definitely have a mold issue in your attic. Below I will go through some causes and common questions we get regarding mold in the attic. Humid Air and Moisture causes mould growth, this is no different in your attic. The majority of the time, condensation occurs in the attic due to poor ventilation which in turn causes moisture and leaks. These conditions cause mildew, wood rot, interior water damage. Left Over time, mould grows and if untreated, it creates a big problem when selling your home. 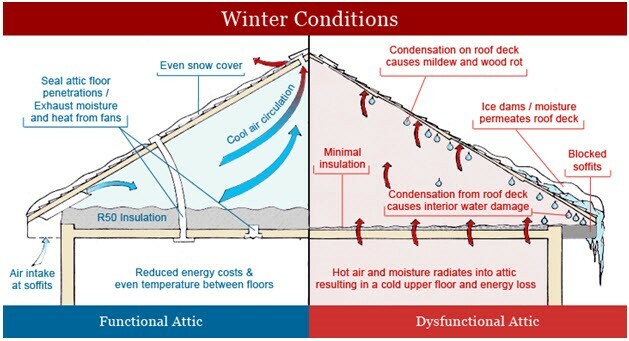 The image below illustrates the ideal house on the left and the problem attic on the right. Every home was constructed with a roof ventilation calculation that is calculated to ensure adequate air flow and circulation. Homeowners occasionally will add to features to their home such as upgrading the insulation or installing bathroom exhaust vents. These new changes can effect the air circulation and create moisture for attic mould to start rotting and decomposing your roof sheeting. Every home situation and structure will vary in terms of size, damage, design etc…. Without inspection of the attic visually, it remains difficult for us to provide you with an accurate estimate, quote and scope of work. That Being said, our pricing is more than fair for the excellent services that we provide and in the grand scheme of things it isn’t all that expensive. Our company offers a guarantee that is transferable to the new home buyers so they can rest assured that the mold issue will never reappear. For an accurate quote please call us today at 613-276-6753 and we will have you speak with an attic mold remediation professional. How Long Does The Remediation Process Take? 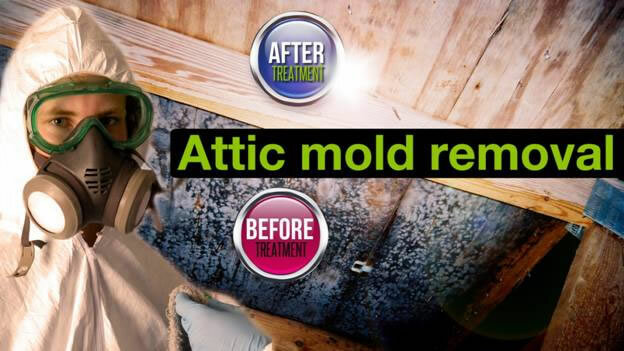 In the vast majority of situations we can remove your attic mould within 48hrs. In fact, if you call us today we can very likely get an inspection done on the same day if you live in the Ottawa-Kanata-Orleans-Barrhaven area. 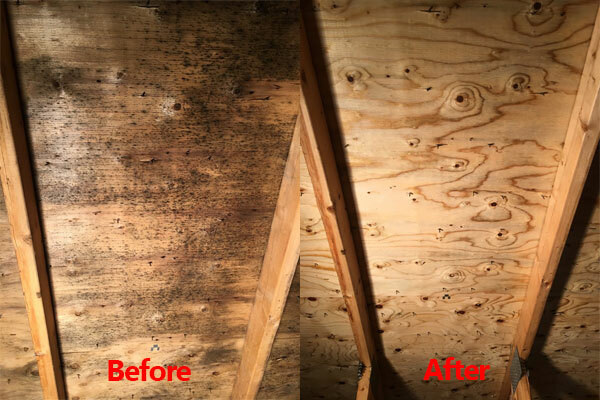 We have been correcting and treating mold related problems in attics for a very long time. Our Ottawa Mold Removal Guarantee Against Future Growth. Our company is confident in our ability to solve your mold problem that we offer a transferable guarantee to the new home owners. The is not just a warranty, it is a guarantee that you will not have future visible mold growth. Sell Your Home With No Worries. When we perform your attic mold removal you can rest easy that the new home buyer and home inspector will pleased and confident. This will allow the transaction to proceed without a hitch. We will remove the mold safely and permanently by addressing the moisture issue that resulted in mold decomposition of the roof sheeting. Ottawa Mold Removal is the leading remediation and abatement company in the Greater Ottawa Area. Our ultimate goal is give our clients proper information, ethical service, and peace of mind for all of their environmental issues.